Chicago’s new marijuana ordinance | What’s up with that? Worldwide icon-chevron-right North America icon-chevron-right United States icon-chevron-right Illinois icon-chevron-right Chicago icon-chevron-right Chicago’s new marijuana ordinance | What’s up with that? How much pot, exactly, is 15 grams? When first proposed last fall, the ordinance set the limit at ten grams of marijuana. After Mayor Emanuel and Police Superintendant Garry McCarthy got on board the weed wagon in June, a City Hall source tells me, the max was bumped up to 15 grams, an amount determined as a solid threshold between personal use and distribution. 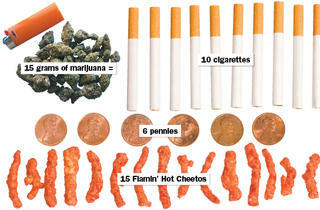 Using the imperial system of measurement favored by stoners, 15 grams translates to half an ounce. In May, New Jersey set the same limit. 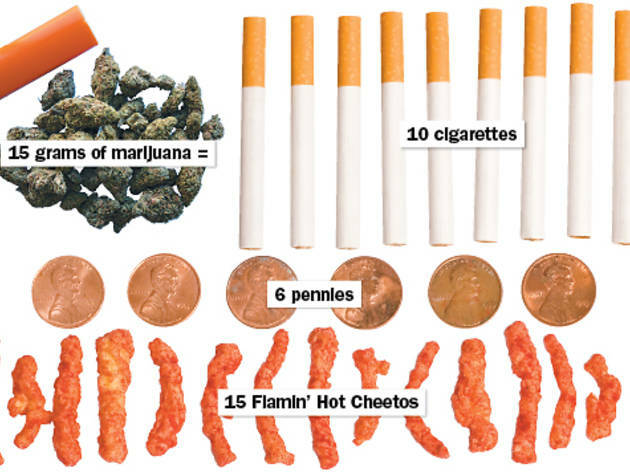 “[Fifteen grams is] around 20 very small joints,” explains Allen St. Pierre, executive director of NORML, the Washington, D.C.–headquartered weed lobby that has been closely following the decriminalization trend. “If you happen to roll large blunts, you could easily roll half of an ounce into two or three big bombers.” Chicago’s ordinance is relatively conservative. Washington state’s cutoff is 40 grams. Ohio’s is a whopping 100 grams. Put that in your pipe and toke it.